Daley Thompson is, quite simply, the greatest decathlete in history. He is also the most successful. Between 1978 and 1986, Thompson set four world records and won gold medals at two Olympic Games, one World Championship, three Commonwealth Games and two European Championships. When he won the world title in Helsinki in 1983, he held every major decathlon title. Francis Morgan Thompson, known throughout his glittering career as Daley, was born in Notting Hill Gate, London on 30th July 1958 to a Scottish mother and Nigerian father who died when Thompson was 13. His athletics career began with Haywards Heath Harriers and he moved on to Essex Beagles. At 16 he competed in and won his first decathlon - the Wales Open at Cwmbran - and broke the British junior record. The following year, Thompson became British champion and made the first of four appearances at the Olympic Games. Thompson was the youngest decathlete in Montreal and youngest member of the British team - his 18th birthday fell two days before the closing ceremony. A precocious figure, he was as high as ninth after the first day but fell away to finish 18th. Nonetheless, he had given rivals an early glimpse of the man who would dominate the sport for almost a decade. The West German boycott of the Moscow Games in 1980 robbed Thompson of any serious competition. His main rival, world record holder Guido Kratschmer, was a victim of that boycott and in his absence Thompson took gold easily. The 100 metres and the long jump - the first two events in the decathlon - were traditionally Thompson's best and a blistering 100m of 10.62 seconds followed by a long jump of 8.00m, a record for the Olympic decathlon, put him in total control from the start. He finished 164 points clear of Russia's Yuri Kutsenko with 8,495 points. Kratschmer and Thompson had clashed before the Moscow Games, in May 1980 at Götzis, Austria. Thompson had won that duel and set a world record, but a month later the German had snatched the world record away in Filderstadt-Bernhausen, Germany. If the Moscow boycott had left question marks over Thompson's dominance, he banished them for good at the Los Angeles Games in 1984. By then Thompson was unbeaten in decathlons for six years, but West Germany's Jürgen Hingsen was the world record holder. Thompson started in explosive fashion with a personal best of 10.44secs in the 100m. His leap of 8.01m in the long jump, a record for the Olympic decathlon, would have given him fifth position behind Carl Lewis in the main event. Yet after two throws in the discus, Hingsen had overhauled Thompson and led by 68 points. Thompson was perhaps not as naturally gifted as some of his rivals and was dwarfed in terms of physical stature, but the flamboyant Londoner was the ultimate competitor and no-one questioned his character, charisma, self-belief or mental strength. 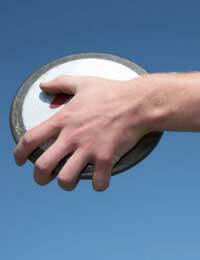 True to form, Thompson produced under pressure and a throw of 46.56m in the final round of the discus put him 32 points in front. The gold medal was secure by the time Thompson lined up for the final event, the 1,500m. He needed a time of four minutes 34.98secs to break Hingsen's world record, but eased up at the finishing line and clocked 4:35.00 for 8,797 points. It meant he had missed Hingsen's record by one point, but two years later International Association of Athletics Federations (IAAF)officials re-examined the photo timer results and discovered that Thompson had completed the 110m hurdles in 14.33secs rather than 14.34. One more point was added to Thompson's Olympic total and he was given a belated share of the world record. It was a little irrelevant by then, because in 1985 the scoring tables used in decathlon were changed and, as a result, Thompson's performance in Los Angeles ranked as the world's best with 8,847 points. The record stood for more than eight years. Thompson was fanatically committed to training throughout his career and the heavy workload began to tell. By 1987, Thompson was unhappily plagued by injury and suffered his first defeat in the decathlon for nine years when only ninth at the World Championships. He sustained a thigh injury while jumping a few weeks before the Seoul Games the following year and was way below his majestic best as he narrowly lost the bronze medal to Canada's Dave Steen.